Between February 2011 & February 2014, I was a resident of Ernö Goldfinger’s brutalist icon Balfron Tower in Tower Hamlets. 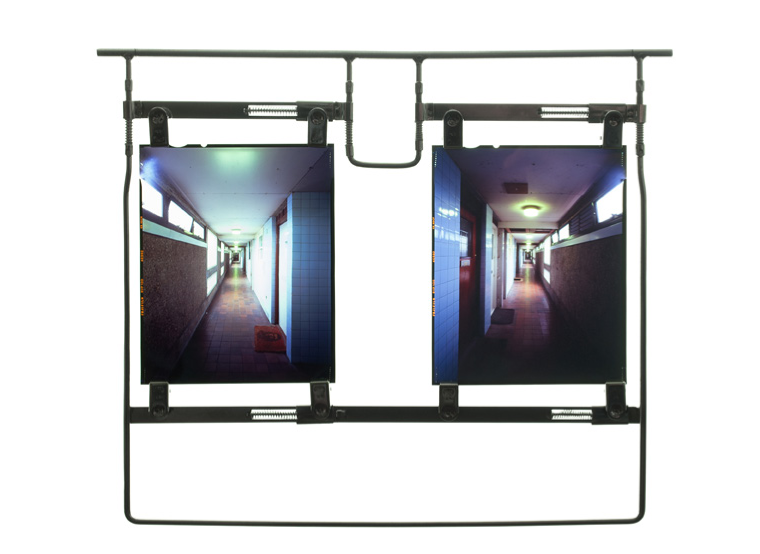 Throughout this period, predominantly making connections through wordof- mouth, I set about capturing, on large format transparency film, from a singular viewpoint, a perspective from within each of my neighbor’s homes. By taking an identically situated photograph in as many of my neighbor’s homes as possible, I intended to deconstruct the form of the architecture of Balfron Tower, with my ultimate intention being to create a photographic sculpture of the building in its geometrically deconstructed form: effectively turning Balfron Tower Inside out. During this process I encountered a glimpse into the function of Balfron Tower and the realities of some of the lives occupying this Grade II* listed, purpose-built social housing block; a block under attack from regeneration by those who claim to have the best interests of the community at heart. Balfron Tower is being regenerated, yet I believe that the proposed wholesale removal of social housing from the block and its subsequent sale on the private market is not regeneration but social cleansing. Saddled with another five years of Tory cultural policy we are experiencing a culture-industry being shaped by powerful forces. In austere times public money for luxuries such as art must engage “the community”. The recent RSA and Warwick Commission report “Enriching Britain: Culture, Creativity and Growth” highlights “participation” as its key recurring feature. But what happens when publicly funded arts organisational agenda conspire against grassroots community creativity? Neoliberal social restructuring is devastating London’s working-class communities, and artists are being co-opted and curated to participate in the PR. Balfron Tower’s social housing tenants have now mostly been “decanted”. Commencing back in 2008 the buildings housing association owner started to split the community up, using a variety of nefarious and ethically redundant tactics.The community was then partly replaced mostly by young, short-term occupants and property guardians with insecure tenancies from landlords commonly referred to as ‘slumlords’. A large number of the 146 flats were being rented to artists by a local “arts” organization to serve as live / work spaces for artists. This process is now commonly referred to as “artwash” and was being tactically and ruthlessly employed at Balfron Tower; a usually highly effective PR tool to be used as luxury flats replaced social housing; with artists paying £800 a month for the privilege of living and working in the tower. Artists were, mostly unwittingly though some with enthusiastic complicity, being used to paper over cracks in the impending privatisation of the tower. However, things did not exactly run to plan. Residents, already incensed by the loss of their homes and the appalling way they were being treated by the housing association, took exception to artists using their homes as the backdrop for their dystopian visions; constantly delayed by film crewsoccupying lifts and obstructing access and also very much aware that the ‘artwash’ was part of the gentrification process that was costing them their homes. This was not helped by the aggressive attitude towards them by the housing association and the arts organization; an Arts Council England national portfolio organization, an organization that paradoxically sells itself as both a resource for artists as well as an agency that uses artists to ‘regenerate’ neighbourhoods and force working class communities from their homes. By late-2010 when I proposed my work, a ban on art projects taking place in or around the building was already being aggressively enforced by the residents committee. There was no mention of this as I laid down a significant security deposit (which was never returned) on top of the £800 for a months rent. I was later told that they believed that I would abandon my work and move on, something I witnessed so many other artists do after trying half-heartedly to get disinterested and often hostile people to participate in their projects. Throughout the three years I was in Balfron Tower, I encountered parameters of aggressive cultural curation that were waging a neoliberal war on the working classes. Revenge evictions and intimidation were commonplace against artists that didn’t tow the line, or expressed even the slightest critique, either through their work or in the media. Topdown art-led social restructuring was being ruthlessly foisted upon neighbourhoods and being generously funded by Arts Council England, whilst allegations of widespread fraud and tax evasion remain uninvestigated. Meanwhile, behind the spectacle, social housing was being asset-stripped. It is my belief that the use of artists as a smokescreen for the social cleansing of social housing is turning communities against artists and damaging a profession that like so many others in recent years, has been subjected to a bland, mono-cultural middle-class curation that is strangling creativity. Art has been reduced to a carefully curated spectacle and those that want to play must conform. How can communities respond to art, and artists, as they are so often encouraged to do so, when artists havecome to symbolize the devastation of their communities? How can the recent plethora of publicly funded reports encouraging diversity in the arts be taken as anything more than well-meaning committee minded groupthink, somewhat detached from the implications the realities these policies are creating on the ground. The result has been that artists are sadly increasingly seen as harbingers of the wrecking ball, or in the case of Balfron Tower, thanks to its now increased Grade II* protected heritage status, harbingers of the impending well-heeled classes, with little or no interest in the social heritage of their luxury, highly fashionable apartments, so long as it has good transport links. A Delicate Sense of Terror (2012) was presented in Urban Transcripts 2012 “London the (n)ever-changing city”, exhibition and conference, in London, UK, December 2012. The series comprises of three rolls of uncut medium format transparency film, mounted in a hand-made lightbox. 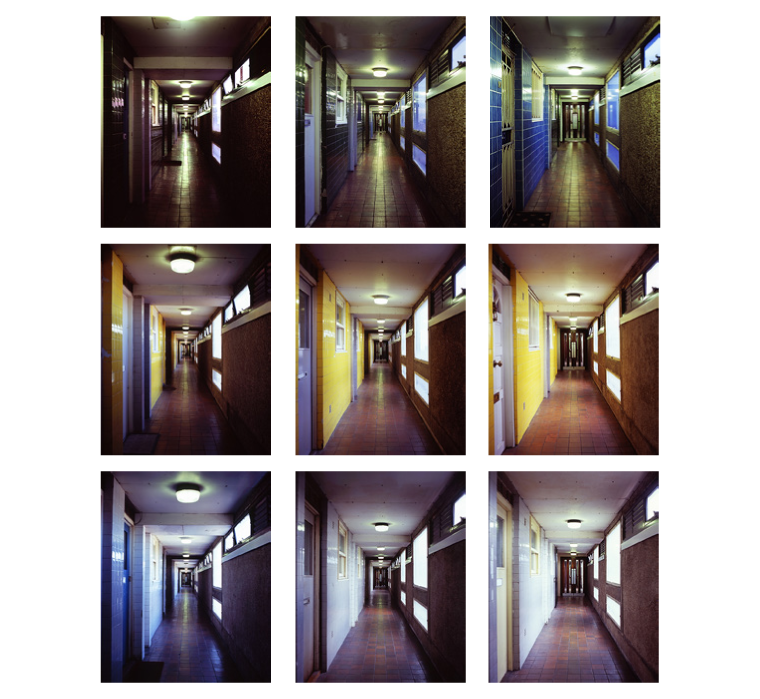 Each roll of film depicts a theoretical slice through Balfron Tower, starting in the morning at the foot of tower, and shooting periodically though the day until nightfall at the top of the tower. The corresponding images on the 2nd and 3rd roll of film were taken on subsequent days using solar time, ensuring that the sun was in the exact same position throughout the sequence. Rab Harling, born England 1972, is a London-based contemporary artist and film maker who specialises in experimental photography and sculptural installations. His practice investigates the social occupation of space, focusing on how people construct a sense of place, and how the design of built environments reflect and actively produce particular social configurations and political ideologies. His installations deconstruct and reassemble pre-conceived notions and understandings about space and time. Rab’s work intersects with a long-term debate in urban culture and policy regarding the relationships between environment and behaviour, particularly in the context of the current housing crisis in the United Kingdom. His practice-based research has a particular focus on the effects of gentrification on the vulnerable, and in particular on the socially excluded and insecurely housed. 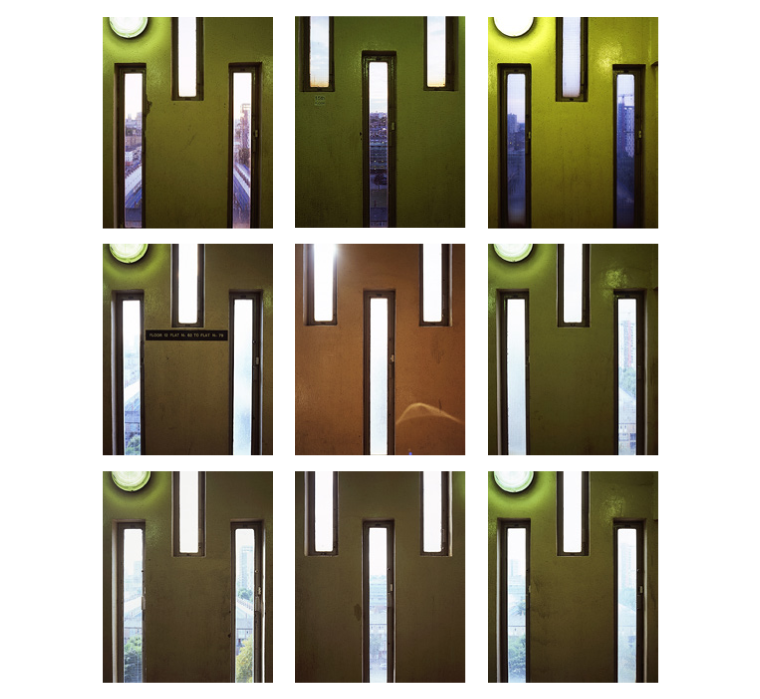 Between 2011 and 2014 Rab captured large-format colour transparencies, from an identical position in 120 of his neighbours’ homes in Ernö Goldfinger’s iconic Grade II* listed Balfron Tower. The resulting 5×4” transparencies depict a “fascinating and moving” (Barnabas Calder, 2014) portrayal of a community fractured and divided by rapidly impending gentrification and eviction. The slow, gradual decant of Balfron Tower continues to this day amidst conflicting political views and planning controversies amongst residents, leaseholders, the local community, the housing association owner, property guardians and their associated landlords, as well as the London Borough of Tower Hamlets. Following a reported £70 million refurbishment, a co-development partnership between registered social landlord Poplar HARCA, LondonNewcastle & Telford Homes, all 146 flats will be controversially sold on the open market, the antithesis to their original purpose as provision of social housing.